Tooth sensitivity is the pain you experience from eating cold foods or drinking cold drinks. Some people even experience discomfort when they chew ice. The pain of tooth sensitivity is usually sharp and sudden. And you might experience the pain as going deep into the nerve endings of your teeth. This sensitivity can also affect one or more teeth. There are many causes of tooth sensitivity. One origin is when the gums pull away slightly from the teeth. The tooth root is exposed and therefore unprotected. That vulnerability allows cold foods and beverages to come in contact with the nerve. Gum loss can also occur from brushing too hard. The friction from the hard-bristled brush or the pressure can also make gums pull away from the teeth. There are additional causes of tooth sensitivity that result from "wear and tear:"
Also be aware of any tooth decay that forms at the gum line as well as inflamed or sore gums. 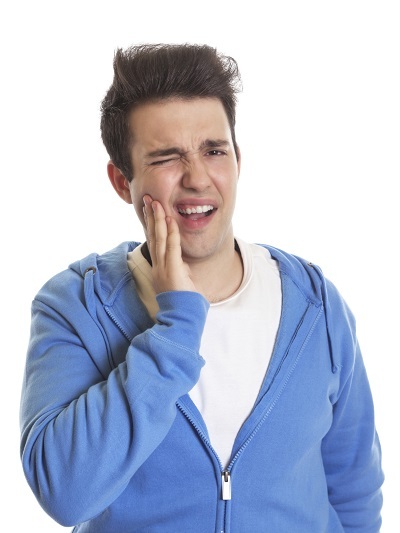 Sometimes tooth sensitivity can occur after dental treatments. Procedures such as teeth cleaning, root canals, tooth restoration, or crown placement can leave a client with a general soreness. However this kind of sensitivity decreases in a few days up to a couple of weeks, depending on the treatment received. You don't have to forego your favorite cold treats due to tooth sensitivity. There are many ways you can find relief as well as understanding your particular causes. We mention tooth-whitening products as one cause of sensitivity. Over the counter whitening products are very popular. However they may be too harsh - even if you don't have sensitive teeth. Look for gentler products, such as certain mouthwashes or toothpastes to help brighten your smile more safely. Avoid - or eat in moderation - the acidic foods that cause your tooth discomfort. Maybe tomatoes aren't painful for you to eat, but grapefruit or pickles are. Know which foods trigger the discomfort. Using a hard-bristled toothbrush may be causing your tooth pain. You can still clean your mouth thoroughly using a softer-bristled brush. Try a medium or ultra soft bristle to give relief to your gums. Then when you brush, move all along the gum line and in between teeth. Using a softer brush may take you a bit longer, but you'll be avoiding the pain. You may also try switching to toothpaste for sensitive teeth. It's reported that regular use should make teeth less sensitive. For additional results, spread a thin layer of that toothpaste along the sensitive tooth (or teeth) or any exposed root, at night before bed. If you're still experiencing sensitivity and pain, contact us for an appointment. Common care can include, tooth bonding, fluoride varnishes, and dentin sealers for exposed roots. If you need additional information on the causes and treatment for tooth sensitivity, please contact us at (410) 381-5030 for an appointment today!